Make your travel greener. Plant a tree by booking holiday with us. More than 2000 trees already planted. Find out more. Not sure where to book your villa holiday? With so much to do and see in Koh Samui, it can be difficult to find the right place to book your villa. But don't worry, we’ll have the right villa - whether you’re here for the beach, restaurants or culture. Feel free to give us a call anytime, as we’re always happy to share our knowledge of the island and to help you seek out the best spots for your holiday. Koh Samui’s most popular vacation spots are peppered around its eastern and northern coasts. Located in the east are the hotspots of Chaweng and Lamai; both offer vibrant, bustling beaches teeming with restaurants, shops and nightlife attractions. Venture up north, and the vibes are slower and more laidback. The coastal towns of Mae Nam, Big Buddha, Bophut, Bang Po and Choeng Mon draw vacationers with its gorgeous beaches, family-friendly setting and variety of local amenities and attractions - from iconic religious sites, to lively walking streets and top-notch spa venues. For a restful vacation, head down South to the towns of Taling Ngam, Bang Kao or head East to Lipa Noi beach. The way of life here is unhurried and mellow, and will suit vacationers seeking to unwind completely. While there are cultural sites and attractions scattered across the region, holidaymakers enjoy taking it slow with leisurely beach strolls, hanging out by the beach or enjoying the best of seafront dining. With most attractions located within a half hour to an hour’s drive from your villa, Koh Samui is best explored through half-day or full-day sightseeing trips - without the need to move around between different locations. Your villa manager will readily assist with travel arrangements - whether it’s renting diving or snorkeling equipment, vehicle rental or booking pre-arranged tours to visit offshore island attractions. "I have your contact and your service is exceptional. Mawar, be sure that I will be contacting you and recommending your service to my friends when ever needed." What can Samui-Villa.com do for you? Trust the Samui villa specialists! Our villa consultants have traveled all over Koh Samui to inspect and select the best private holiday villa rentals on the island. Since we have already done the busy work for you, you are able to save time and just give us a call or drop us an email to let us know what you have in mind. As soon as we get your details, one of our villa consultants will be in contact with you to better understand what you are looking for during your Koh Samui holiday. We are available 7 days a week and the best part is that we speak your language: English, French, Indonesian, Dutch, German, Chinese and Spanish. Once we understand better your holiday plan, our villa consultants will send you a shortlist of available villas for rent matching your criteria and budget. We have direct contracts with Koh Samui villa owners and therefore can guarantee not only the best price for your villa, but also a direct and reliable access to their villa calendar. With this, we can place an option on a villa for you at no cost, anytime, including weekends. This will give you 3 days to discuss your plans with friends and family before committing to a reservation. Once you confirm, you will be invoiced by Samui-Villa.com, a Singapore-registered company, guaranteeing a safe and secure booking. Our concierge service will take care of your arrival: we arrange not only your welcome at the airport but also your check-in at the villa. 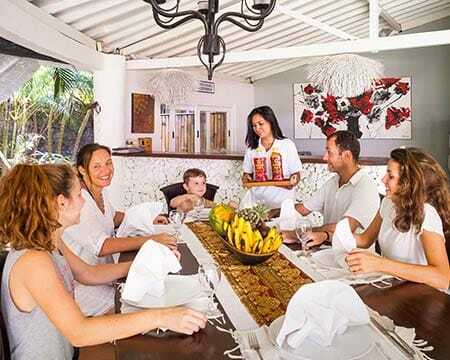 Once you have arrived in the villa, the staff is here to accommodate your group, arranging everything from day tours and spas to delicious meals and babysitting services. If you have any special requests, you can always call our concierges, available 7 days a week to cater to your every travel need.